I became aware of Waitress the musical a few summers ago. We were at dance nationals and my oldest daughter took a Master Class where they used one of its’ songs. My daughter, wife, and I instantly became big fans of that song. It’s what put Waitress on our radar. 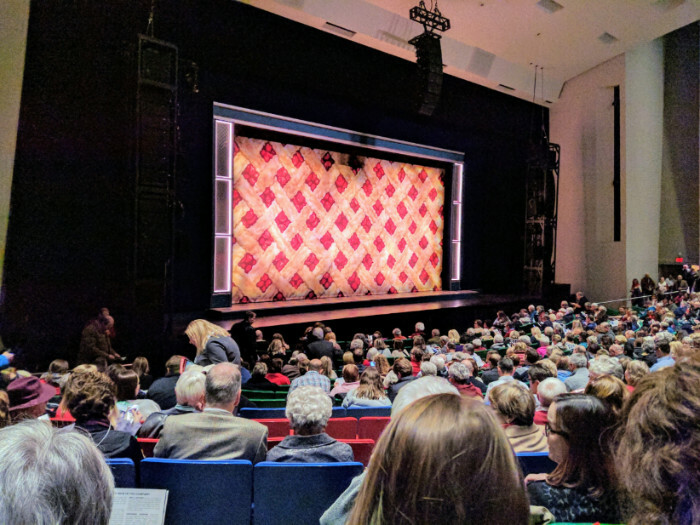 So when I got the invite to attend the December 5, 2017, opening night performance at Des Moines Performing Arts I was excited to be able to go… but knew I had two ladies at home who would really want to be my “plus one”. In the end, I took my wife and we had a great date night. Waitress was perfect for that but would also be great for a girls night out too. 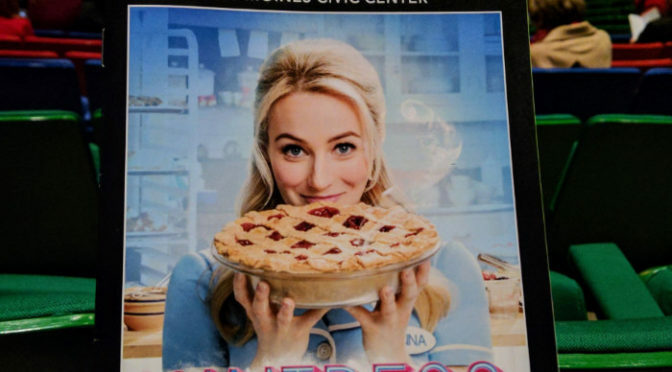 It’s all about, Jenna, a waitress and expert pie baker, dealing with an unloving and abusive marriage, and how she finds the courage to deal with the difficulties in her life. To me, Waitress is all about relationships; good ones, bad ones, unexpected ones, forbidden ones, and even quirky ones. They all fit together nicely in a roughly 2 hour and 15 minute performance that I’d describe as a sitcom, inside a drama, inside a musical. The comedic timing was impeccable, the characters well developed, and the acting was some of the best that I’ve seen in any Des Moines Performing Arts show. There was one point without any dialogue that drew many laughs. So much was being said through body language, breathing, and facial expressions that words weren’t needed. Makes me smile thinking about it now. The music is what I was really looking forward to in this performance and I wasn’t disappointed. Everyone on stage is a gifted vocalist and uses their talent well. The orchestra pit was empty for this show and the band actually slid on and off the stage in a way that I felt added to the performance. If your only experience with musicals is Oklahoma or South Pacific know that the music in Waitress isn’t anything like those shows at all. The music and lyrics were written by Sara Bareilles, giving it a very contemporary feel and sound. There are many great songs in Waitress. Some are hysterical, some are touching, and some are just plain emotional. I got goosebumps when Desi Oakley, playing the role of Jenna, broke into She Used To Be Mine. That was the song that originally got me interested in this show. One other cool thing that I enjoyed about this performance is how they cast 2 young, local girls to trade off playing a small part in the show. 5-year-old Eliana Mann from Urbandale played the part of Lulu in the opening night performance and she was great. The sold-out out crowd was invested in the performance from the unexpected and funny reminder to mute your phone to the final curtain call. There were cheers, applause, and reactions (in a good way) in places that I wonder if they caught some of the actors off guard a little bit. I also wonder if the cast was surprised at how quick they were rewarded with a standing ovation. Hopefully, Des Moines is getting a reputation as a theatre-loving town! After the show as we walked back to our car my wife said, “I think that is one of the best shows we’ve seen!” I was quick to agree. 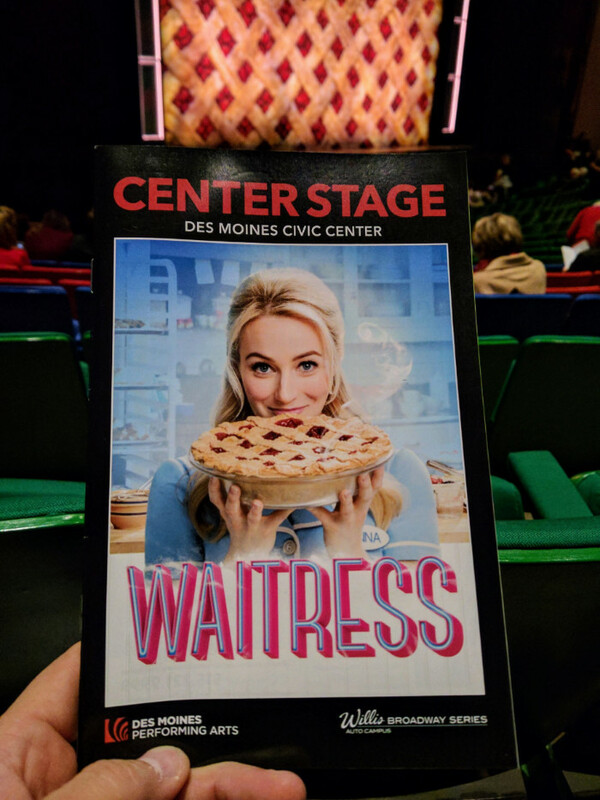 Waitress runs through December 10, 2017 at Des Moines Performing Arts. You can learn more about the show and get tickets here. ***Disclaimer – I was provided with free press night tickets. All opinions are my own.